Easter 2013 was a new range released on Habbo on the 22nd March 2013 ready for Easter on the 31st March in the same month. The range featured many new furniture alongside some older ones that had been released as part of the Flower Power range in previous years. The items weren't as cheap as Easter furniture had previously been. The range also featured some rentable items which a player could rent with Duckets alongside more ranges that featured players winning Super Rares. Blue Flower What kind of magical glowing flower is this? Garden Teleport The easiest way to get from one garden to the next! Glowing Garden Floor 3 states! High Garden Stage Did that stage just lay an egg? Mushrooms Do these look edible? Red Flower What kind of magical glowing flower is this? Yellow Flower What kind of magical glowing flower is this? Easter Chair Sit back and watch your garden! 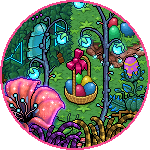 Crackable Eggs were released on the 28th March 2013, during the Easter 2013 campaign on Habbo and the range featured 4 new yet similar items. The eggs allowed players to win prizes varying from Ducks to Super Rare Blue Submarines. The 4 different items were based on levels and featured 4 different colours, red, blue, green and yellow - often referred to as gold. The aim was for players to click "use" or double click the egg until it cracked. The eggs had different amounts of tapping that was required in order to find the prize inside; this started from 1,000 cracks to 20,000. Only the Crackable Egg - Level 1 offered furniture that players could get elsewhere on the hotel; this being by the MarketPlace or trading rooms. The egg gave out Gray Area and was the easiest and cheapest to obtain at 3 Credits per egg. The Crackable Egg - Level 4 only offered the rarest items such as the Easter Head Statue and the Blue Submarine but the submarine appeared the hardest to get due to the rarity of the item and the need for it; the Blue Submarine was a recolour of the Ultramarine - an item given out during the merge for compensation.